I have made Harissa chickpeas and rice 4-5 times now. It is so good and so simple with an instant pot. I chop some onion or shallot and garlic and then put them in the instant pot along with a cup of garbanzo beans, a cup of vegetable stock and ~3 cups of water. Squeeze in a quarter of a tube of harissa paste, and season with salt. Cook on high pressure for 1.25hrs and then quick release the pressure. Add in 3/4 cup of rice and cook on high pressure for 15 minutes. Slice and toast some crusty bread. 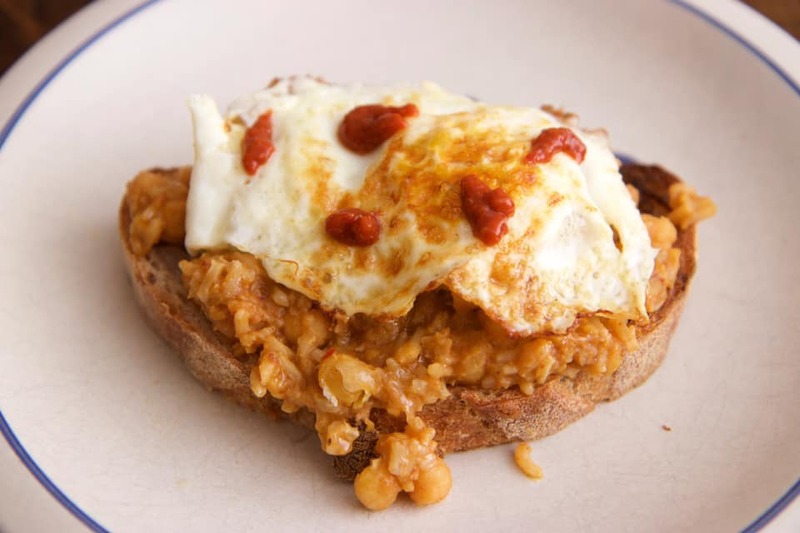 Serve bean and rice mixture on toast with a medium to nearly hard egg. Garnish with extra harissa if you want more spice in your life. A hobby of wine making brought bothers Ben and Josh Hill to open Burnt Timbers Winery in June of 2017 on a 100+ acre farm that sits along the Juniata River in Central PA that has been in their family for generations. So how did their name come to be you may ask? On the property sits a circa 1840's farmhouse that housed the family of ten at the time, but the home caught fire in a cooking accident and sat abandoned until Ben and Josh's parents took over the farm, they renovated the house (it's available on VRBO!) and left the exposed beams that show the burnt timbers. Therefore, Burnt Timbers Cottage and Winery name came to fruition. Their logo shows a burning canoe representing how the native American’s went about making their dugouts for life along the Juniata river. Their grandfather who's farm they have their business on today was a lifelong beekeeper, so they looked to incorporate that history into a wine, an off dry mead, that has become one of the fan favorites. They are constantly working to broaden their selection without compromising on quality with the goal of having a nice balance of dry, sweet and fruit wines that all can enjoy. Burnt Timbers opened their Central Market stand this past May and are excited to part of the historic center of the city. Visit them for a taste of their current portfolio of wines. Learn more on their website. We're excited to partner with the Appell Center this year to throw a downtown York Easter celebration. The day will start at Central Market with free photos with the Easter bunny, egg hunt, kids' craft. Meet Catalina! Central Market York’s newest vendor, Catalina Ruiz took over ownership of Just Cupcakes and has rebranded to Cupcakes & More. Catalina has had a passion for baking good cakes and desserts since growing up in Mexico and being surrounded by her grandmother and mother making homemade desserts from scratch. When she moved to the U.S. she learned English from cookbooks and worked at Wickeys Catering, and now a Downtown Yorker for many years, she has been baking for friends for over 15 years, including cupcakes for birthdays, wedding cakes and traditional Mexican breads. She continues to educate herself on new techniques and regularly attends classes, most recently attending a Whitcomb cake decorating class with a focus on fondant. Catalina is excited to join the market family and be able to offer a variety of her signature treats like tres leches cake, chocolate flan, artistic flowers and special breads. Follow Cupcakes & More on Facebook and Instagram to keep up to date on all their offerings.